U.S. Special Representative Zalmay Khalilzad meets with Afghan leaders, including President Ashraf Ghani, on April 3. His frustration was made public by Ghani’s National Security Advisor Hamdullah Mohib last month, who accused Khalilzad of trying to advance his own political agenda with the formation of an interim government. Such a blunt comment had an obvious outcome. Mohib was summoned by the U.S. State Department and barred from traveling to America. This is one dimension of the tricky Afghan peace process. Another was observed when Pakistan Prime Minister Imran Khan proposed an interim government in Afghanistan to help achieve the target in the ongoing peace efforts. Khan’s comments not only sparked an angry reaction across the border — Kabul recalled its ambassador from Islamabad for consultation — but also forced Khalilzad to express his discontent. “While Pakistan has made constructive contributions on the Afghan Peace Process, PM Khan’s comments did not. The future of Afghanistan is for Afghans, and only Afghans, to decide,” Khalilzad said in a tweet on March 26. Pakistan, by facilitating the peace talks and travel of Taliban leaders, bagged much sought-after praise from Washington, yet some of its measures are still being seen with distrust in Kabul. Pakistan’s Foreign Office cooled down anger in Kabul by clarifying that Khan’s statement regarding an interim government in Afghanistan was presented “out of context.” But to the dismay of the Afghan government, Khan repeated the same words a week later, this time, during a public gathering while standing few miles away from the Afghan border in Khyber tribal district. Unhappy about not sitting across the table with the Taliban negotiators, let alone taking the lead role, Ghani is silent. But that silence, many observers feel, is not going to last long if he continues to feel cornered, particularly when his opponents are holding meetings with the militia’s leadership. Notwithstanding those hassles, the peace talks have achieved certain goals even while the engaging sides cling to their viewpoints. While two among the three key players – the Taliban, the United States, and the Afghan government – are directly engaged in peace talks, the third is still hoping to be included. A fourth, Pakistan, which is an indirect but important actor, is seen both as a facilitator and spoiler, depending on the level of pressure from the international community and its perceived interests in post-withdrawal Afghanistan. 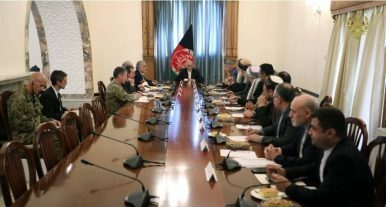 So far, the Taliban have agreed not to allow terrorist groups or individuals on Afghan soil after an agreement with the international community. To move further ahead, the Taliban want the United States announce a withdrawal date for the remaining U.S. troops, but the timing has yet to be agreed upon. As part of an exchange of prisoners, which some see as a confidence-building measure, the United States had already released five Taliban prisoners and let them join the Taliban office in Doha under guarantees from the Qatari government. But the United States’ next demand is for the Taliban to announce a ceasefire, be that temporary or permanent, to which the Taliban may not easily agree. A big chunk of militia forces did not return to join the fighting after the end of the temporary ceasefire during last Eid. Many Taliban fighters were captured on cameras posing for selfies side-by-side with Afghan policemen, military personnel, and locals in Kabul and other cities during the temporary ceasefire, a development that made the Taliban leadership worry about losing control over the young fighters if allowed to mingle with their countrymen. Can a Peace Deal Hold? While the peace talks are still in the very early stage and it may take months or even years for the two sides to strike a deal, there are concerns about the sustainability of a possible agreement if the international community withdraws from Afghanistan. And the foremost of those concerns is how Afghans view the Taliban either getting a share in the government or taking the lead role. A 2018 countrywide survey by the Asia Foundation reveals that 82 percent Afghans show “no sympathy at all” for the Taliban. The same survey shows that around 42 percent Afghans believe peace with Taliban is impossible. “No one in Kabul, none among the regional players, not even the ones known to be Taliban supporters or sympathizers, feel comfortable with the idea of the militia’s assuming the lead role in post-withdrawal Afghanistan,” says Kabul-based analyst Hekmatullah Azamy. Still, some former jihadi leaders are believed to have silently established contacts with the Taliban, an understandable trend in a pre-dominantly tribal society where the most powerful often remain the center of focus for individuals and groups to safeguard their family, group, and communal interests. There are two possible scenarios — an agreement or no agreement — as the U.S.-Taliban peace talks resume in Doha following the intra-Afghan dialogue. Under the current circumstances, the Taliban seem hesitant to accept anything less than a lead role in post-withdrawal Afghanistan. But without prior guarantees, such a role will not only antagonize vulnerable sections of the Afghan society — such as women and the Shia Hazara community, who have a history of bitter memories under the Taliban — but also the ethnic Tajik and Uzbeks, who had fiercely resisted the Taliban under the banner of the Northern Alliance in the 1990s. This may also affect security just across the border in Pakistan’s tribal region, where the tribal people suffered because of the al-Qaeda and local Taliban alliance in post 9/11. Some strict believers, mostly mid-ranking commanders, and interest groups among the Taliban may disagree with bringing an end to the ongoing “jihad” and may join the ranks of the so-called Islamic State in Khorasan Province (ISKP) to continue the fight. In the second possible scenario, which is U.S. withdrawal without reaching an agreement, the conflict may worsen, inciting more violence in Afghanistan. That may provide an opportunity to regional players and transnational terrorists to step forward for a new proxy war on the Afghan soil. What needs to be done to help avoid more bloodshed? The country demands solid international guarantees against foreign meddling, assurances of transfer of power through democratic means, continued economic assistance with a high degree of transparency through strict oversight, and uninterrupted support for the Afghan military and police. Leaving Afghanistan in the lurch at this stage of the country’s social transformation, where the younger generation has just started benefiting from the information age, is tantamount to spoiling the gains achieved over the past 18 years by expending a huge volume of both blood and treasure. The decades-long conflict and failures of talks in the past provide enough room for pessimists to question the whole process, but the Taliban willingness to continue talks and a high degree of eagerness among Afghans for peace is reason enough to give voice to optimism. Still, there are not going to be any quick fixes, keeping in mind the different phases of the nearly four decades of war and conflict that had shattered the social fabrics of the tightly-knitted Afghan society.